The Statis-Pro baseball game cards for every 2019 player are now available, and we debuted the set with a thrilling matchup of the best MLB players from Dominican Republic playing the best from Venezuela. 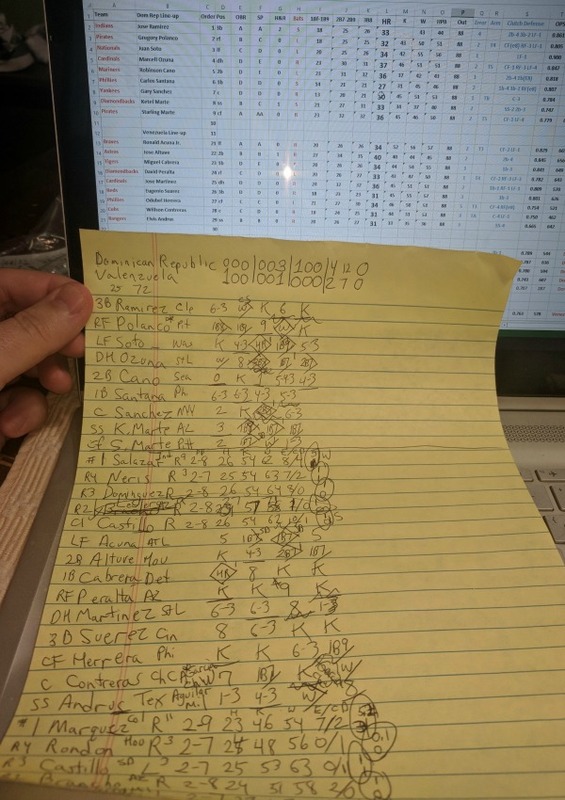 We found typing in the order of the batters on this spreadsheet of all players made keeping the line-ups on the screen and writing down results very easy. Here is what the line-ups looked like on the screen, while we actually wrote out each pitcher's line of results on the scoresheet when they entered the game. Learn to play Statis-Pro Baseball in 5 minutes by clicking here. Because we adjust the cards to show how good the batters and pitchers would be on a neutral field, Venezuela had a chance with Rockies' ace Marquez registering as one of the best 5 percent of all pitchers with a PB control factor of 2-9 (meaning he keeps the action on his card and away from the batter on rolls or card flips of 2-9 to only let the batter have a chance at an extra-base hit on a 10-12. He outdueled the Indians Salazar (a PB2-8 as one of the best 15% of all pitchers) for five innings to hold a 1-0 lead and catcher Contreras from the Cubs gunned down the Indians' Ramirez trying to steal to preserve the shutout through that point. However, the Dominican Republics bats eventually proved too strong as the Dominican Republic's sixth inning started the Nationals Soto blasting a home run to tie the game, then the Cardinals' Ozuna following up with a triple, the Yankees Sanchez with a two-out double, and finally the Diamondbacks K. Marte with a single to complete an "inning cycle" to take a 3-0 lead. The last single was off the Astros Rondon to close the books on Marquez 5 2/3 inning, 7 hit, 3 run outing. The Dominican Republic continued to hit and finished with four runs on 12 hits. Venezuela kept the pressure up against four relievers. The Braves Acuna twice singled and stole 2nd, and the second time the Astros Altuve doubled him home to cut the lead to 3-2. The Diamondback's Peralta then drove an unusual ball deep into right for an apparent game-tying double, but the Pirates' Polanco saved the Dominican Republic's lead with a diving catch. Polanco's leadoff walk was followed another hit from both Soto and Ozuna to finish the scoring with a 4-2 Dominican Republic win. The Rays' Castillo came in to close it out, but with two outs Venezuela's No. 7 hitter Herrera singled and that let them go to the bench to hit for the two bottom hitters in their order. The White Sox A. Garcia drew a walk to put the winning run at the plate and give the Brewers' Aguilar flew out to center to end the game. Because we play two-game series and make teams throw their 4th best starter after the ace the Dominican Republic will need to skip their No. 2 and No. 3 starters - the Yankees Severino (PB2-8) and Reds Castillo (above average as a PB2-7), to throw the Cardinals' Martinez (mediocre as a PB2-6). Venezuela will have an edge since their 4th starter is a PB2-7 in Senzatela, another under appreciated Rockies starter who is actually strong once the adjustment is made since he does not need to pitch in Coors' field, however Venezuela is skipping an even better No. 2 than Severino as the Indians Carraso is also an elite PB2-9, while their No. 3 starter is the Red Sox Rodriguez. We plan to also let the two states with the most MLB talent, California and Florida, field teams while letting other countries and states group together to take on the big two countries and big two states.